I am standing in line at one of the many Dunkin’ Donuts at Logan Airport on a Wednesday morning. It is six o’ something or other, and I am grabbing a coffee before I head to Chicago to visit some friends. 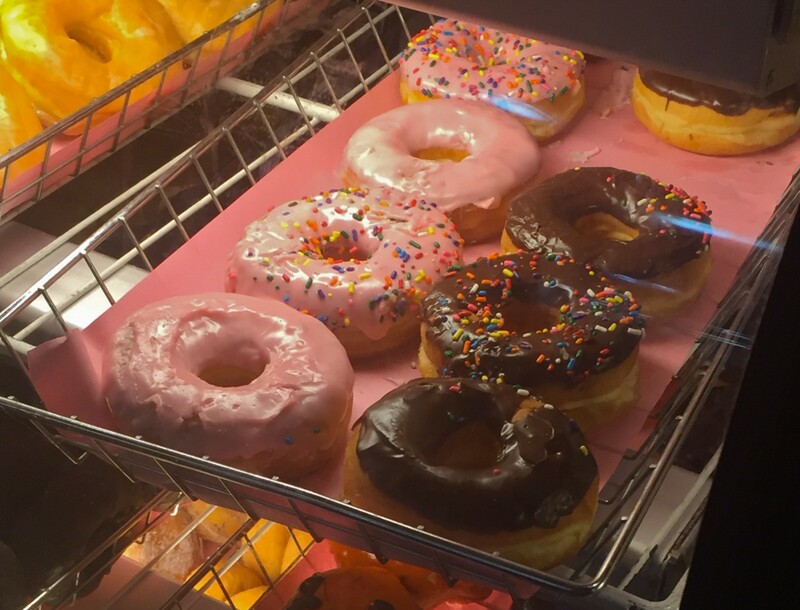 As I stare in bleary absence past the man standing before me in line, my vision and brain suddenly register two things: a pink sprinkles donut and a memory. It isn’t a story memory. It is a childhood snapshot memory, a remembrance of place and emotion: I am standing in a coffee shop that my parents always take us to after church. I am no more than four years old. Copper pots hang gleaming on the walls, and the smell of ground coffee is heavy in the air. Before me is a bakery case, and in that case lies the object of my desires. It is frosted with pink icing. It is covered with rainbow sprinkles. Truly, there could not be anything else in the world that I had ever wanted or would ever want again more than that pink rainbow sprinkles donut. The icing had softly hardened into a satiny sheen, and the tiny flecks of color dotting it clung with mouth-watering tenacity. My father orders, the five of us crowd around a tiny table, and my mother slides a napkin towards me. Upon it lies a pink frosted donut with rainbow sprinkles. I laugh to myself as I come back to the present. Oh, why? Why? Why do we “grow up” and stop yearning for—and truly appreciating—those very remarkable little things? I can’t stop asking myself that question all day. Nor the next day. Nor the next. I am haunted by the sprinkles donut. So when the TSA man presses the handicap button and holds the double doors open for me on my return home, I thank him with an overly dramatic gesture — and he suddenly breaks into a rollicking laugh as if I’ve made his night. When the waiter brings not just my bottle of beer but a frosty cold pilsner glass to drink it in, I comment on his forethought, and his dimples crack with a huge grin. When my husband reaches to grab me as I walk past with a basketful of laundry, I thrust my hips in his direction and revel in the swelling of my heart at his obsession. Life is full of pink-frosted, rainbow-sprinkled donuts. Keep your eyes open, be grateful, and joy will be sure to follow.